Although in general, Pantherella’s beautiful sock designs are made to be seen, this is the last thing they want for their Pantherella Cotton Shoe Liners. That fact doesn't mean that they have skimped on quality though; these low on the ankle footlets are made using fine, light Egyptian cotton, prized for its smoothness and strength. 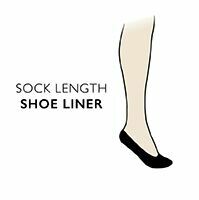 The sock liners are made in Pantherella’s Leicester factory with a breathable weave top, ideal for trainers or summer heatwaves, as is a special antibacterial finish that has been applied, to help keep feet fresher. They are constructed with mid-foot elastication, providing support and hold, as well as Pantherella’s usual hand linked toes for smooth seams. A silicone heel grip in the back of each liner helps keep them in place without sliding under the foot during the day.